As an immature rebellious adult female with grey streaks through my hair there are certain behaviors which bring joy to my life. Racing my bicycle the wrong way down the street at full speed through a pile of leaves is one. Taking long walks in the pitch black of night so I can peer into people’s windows as I slowly stroll by is another. Jumping my red Vespa scooter over divits in the road and off sidewalk curbs also brings me jovial happiness. Oh yes, and gleaning fruit off neighborhood trees around town. But what especially brings me gleeful ornery joy is my refusal to cook and bake the proper way, especially when making cookies. When my husband started a new job two years ago, I began baking cookies for him to bring to work once a week and many more over Christmas for his employees. I figured after awhile people would grow tired of cookies and I could stop. So far this hasn’t happened, and I’m ensnared in cookie baking madness. What I’ve managed to do though is make every single 106 different types of cookies the wrong way. It’s these little naughty things in life that bring me joy. 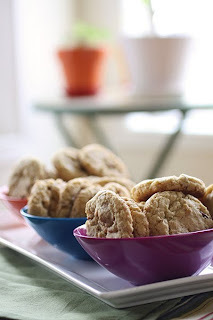 So, when Sherri from Everything in Moderation wrote about her mother’s “Gain Friends and Influence People Oatmeal Pecan Cookies” I had to make them, but I also needed to mess it all up and do it the wrong way. I mean why stop now when I’m on such an ornery roll? I trust Sherri’s baking and cooking, and when she talks about her mom it makes me sit up and listen. 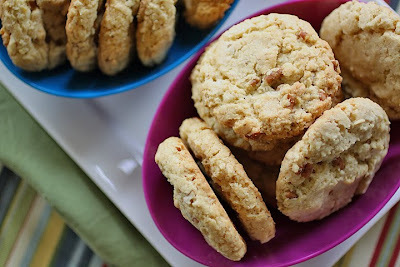 These crunchy cookies are just plain awesome. I love them so much in fact, next time I might even make them the proper way. 1. Line cookie sheets with parchment paper and preheat the oven to 350 degrees. 2. On a plate, cook pecans in the microwave for 1 ½ to 2 minutes stirring every 30 seconds until toasted. Set aside. 3. In a stand mixer, beat together sugar, oil, vanilla extract, and coconut extract on medium speed for 2 minute. Add the eggs and beat for 1 more minute. Then add the oats and mix until combined. Mix in the cake beat just until mixed, and then mix in the pecans. 4. With a standard (size 50) cookie scoop, scoop the dough and place on the parchment 2 inches apart. 5. Bake for 12 to 14 minutes or until or until golden brown on the bottoms, very lightly brown on top and no longer wet looking. Cool on wire rack. Visit Sherri and her mother to learn the proper way to make these cookies. Pictures by Laura Flowers. Laura these cookies look amazing. Great photos. I like the addition of coconut extract. I'll have to give that a try too! Thanks for the link of love. You rebel you! Love your photos! We have a cakebox cookie recipe we love also..so I am all for trying yours..the coconut would be the kicker for moi! You drive a red Vespa? Cool..I really liked this post.. I am reading A Home Made Life.. have you read it? You would love it je pense! This is a very interesting recipe! Your photos are fabulous! Wouldn't it be completely wild and rebellious to also add raisins? (Or, maybe that's too traditional and conservative). Either way, they sound yummy! It would make you rebellious so sure go ahead. And hi ladies! Thank-you for visiting! This sounds like an excellent cookie!! I didn't know you were SUCH a rebel...picturing you riding your bike through a pile of leaves. Lol I'm the super nerdy kinda rebel Coleen. These sound amazing - I can tell from the photos that the texture is just right too. They will be baked! Ooh I am definitely making these! If I had a cake mix in the house I'd be off to do it right now! These are such good cookies. Sherri's mom really knows her stuff. I hope you like them too! So a total of 4 cups oatmeal? Omgosh no, Thank-you Mary! I'll go fix that yikes. OMG..cake mix in cookies! My son's favorite cookie is oatmeal and the rebels that we are, we add chocolate chips. As my son says, "Mom, everything tastes better with chocolate!" Thanks for stopping by my site...I was having Blogger issues then and I'm sure my pics were all over the map! I still can't make it work right since I upgraded...have you had any issues? Enjoy your day...on your Vespa, per chance?